Thank you for all you do to promote board certification from PNCB! For materials and giveaways, please complete this form and submit for processing. * 1. To receive your order, provide your preferred mailing address in full. For ease of delivery, you may prefer to have your items sent to a home address. At this time, PNCB is only able to ship to the United States and Canada. * 2. What is your title/role? * 3. Do you need your items by a certain date? Please let us know. Note: To ensure delivery by your deadline, orders must be placed at least 3 weeks in advance. Orders placed less than 3 weeks from a deadline will be fulfilled as quickly as possible, but PNCB cannot ensure delivery by the requested deadline. 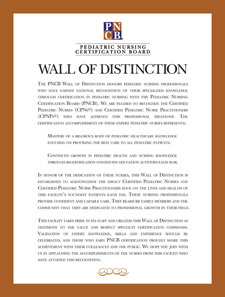 Honor your CPNs and CPNPs with this 18” x 24" color poster and share with the public what it means to have certified pediatric nursing professionals on staff. Order one for your hospital or per unit. Offers RNs interested in certification and exam candidates a concise overview of eligibility requirements, the application process, and other important details. Offers exam candidates a concise overview of eligibility requirements, the application process, and other important details. 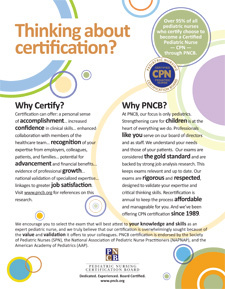 This 8.5” x 11” flyer highlights the benefits and unique characteristics of the PNCB’s Certified Pediatric Nurse (CPN®) credential. This 8.5” x 11” flyer provides a step-by-step checklist to help you plan and prepare for your exam. Share these handy postcards to encourage others to get certified! * 14. Would you like a small giveaway for your nurses or your event? Let us know approximately how many to provide. Have a question? Don't see something you need? Contact PNCB directly at info@pncb.org.